I was setting up the Windows Service Bus on a Windows 10 laptop, on which I logon with my hotmail email as my Microsoft userid. I creating my first C# program, and following the instructions here: MSDN Developing an Application/Service Namespaces. 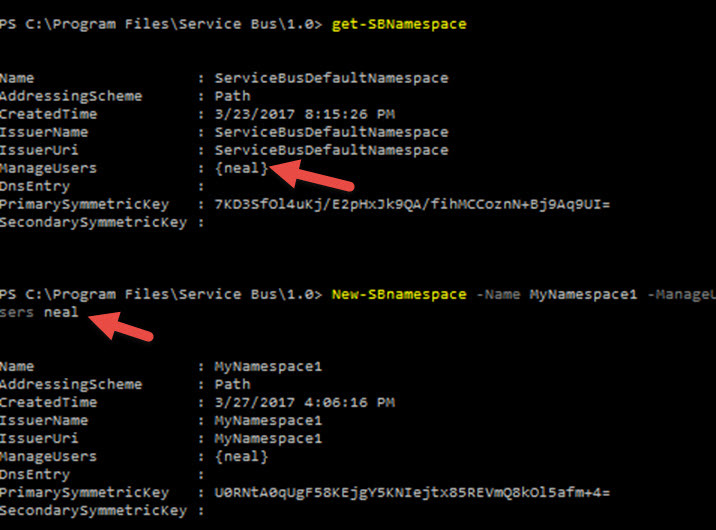 This post entitled “How to setup Service Bus PermissioN?“, gave me the idea to run the Get-SBNamespace. Let’s suppose my hotmail was NealSomething@hotmail.com. Then I see that my username listed is just “Neal”. This name matches the disk structure for “My Documents”, for example: C:\Users\Neal\Documents. The results of the Get-SBNamespace and the successful New-SBNamespace can be seen below. I see that “neal” (lower case for some reason) is listed under ManageUsers, so I specified that user on the New-SBNamespace command and it worked. Which MSDN License is Needed for BizTalk 2016 Developers? I had the following chat via a Microsoft Chat/Sales guy today. Microsoft Answer: In order to have access to BizTalk Server 2016 you’d need VS 2017 Enterprise with MSDN or the MSDN Platforms subscription. I can help you get in contact with a Microsoft Reseller to provide you or your client a quote to purchase this product, would this work? Neal Question: And can you confirm this… If admin installs BizTalk, but then two developers use the system on a regular basis, would we need just 2 MSDN licenses? or does the Admin need one for a total of 3? Microsoft Answer: You would need a total of 3. Visual Studio and MSDN are licensed in a Per User basis, so each user would need his/her own license/subscription. Neal Question: Ok, so by just have the developer install it instead of the Admin, we save a whole license? That doesn’t make a lot of sense. Microsoft Answer: Each user that needs access to Visual Studio, MSDN or any component like software downloaded, would need his/her own license/subscription. Does this make sense? The Professional “Standard” includes one CAL (Client Access License) to TFS (Team Foundation Server). It looks like Microsoft has decided to phase out the term MSDN in favor of “Visual Studio Subscription”, but then, you still see (MSDN) in parentheses after some of the product. They really like to muddle it up to be very confusing. I think bottom line, they want you to talk to a sales rep.
For Visual Studio Pricing, they have a similar doc called: “Visual-Studio-2017-Licensing-Whitepaper-March-2017.pdf“. Everywhere that I’ve worked and consulted, the Enterprise edition is used. The “branch” edition is a concept that you buy a cheap BizTalk server for customers or remote offices, and each one would have very limited processing, usually sending the data on to the main BizTalk server which would be the Enterprise edition. I’ve yet to actually work with anyone that uses this. We all know that Microsoft is infamous for moving their links around, but as of today, you can download the “BizTalk Server 2013 R2 Licensing Datasheet and FAQ” from the linked title. They don’t seem to have a similar document for BizTalk 2016 yet. You have to have that document to see the side by side comparison grid of the different versions of BizTalk (Branch, Standard, Enterprise, and Developer). The main difference between Standard and Enterprise, as it has been or many years, is that the Standard edition is limited to 8 cores, and it only allows 5 applications. What is an application? That’s a bigger question. Usually, it’s rather clear and ties to your development project. Management wants to accomplish a project, they fund it, and you create an application to solve the issue. But, who is to say you couldn’t put two “systems” in one “application”? The other thing I’ve never found out for sure, if having a sixth application won’t work in the standard edition, or whether it is just a violation of your license. As I mentioned above, everywhere I’ve been, we have always used the Enterprise Edition. The second difference is that Enterprise has more features for scale out, failover, and high availability (i.e. clustering). It allows you to have multiple message box databases, typically spread across different SQL servers, in order to spread the I/O load for heavy volume systems. While I’ve used clustering in many sites, maybe only one site of the dozen I’ve worked, has split out a second message box database. The developer license actually does everything that the Enterprise can do, and thus can be used in your dev and maybe QA environments. The above PDF document also explains the “Per Core” license model, which is also explained in the article on the BizTalk 360 site above. Neal Question: Hi, I was here the other day, and needed clarification on something. If we are installing BizTalk 2016, and let’s suppose an Admin installs it on a server, and the developer uses it regularly after that., he said we needed two licenses. But my question today is, could the admin use the MSDN Platform license? Microsoft Answer: Hi, Neal, I’ll be glad to help you with your questions about MSDN licensing. Well, 2 people will need to use any software from the MSDN subscription, then, both would need to be licensed for it, unless the admin already has a license for BizTalk 2016, then, no additional licenses are required. Neal Question: If we have BizTalk licensed for Prod, then does that qualify the admin to install it on Test servers? Or is MSDN needed for that? Microsoft Answer: Well, if you have the license, you can use it for testing. But, your production license is only for one server, with MSDN you are able to install it as many times as needed, but, only the MSDN licensed users are allowed to use it. Neal Question: Ok, so back to my original question – does the MSDN Platforms include BizTalk 2016? Microsoft Answer: Let me look it up real quick for you. Eventually he came back and said it was included. But bottom line, it’s hard to get a clear answer from even these licensing support guys. They almost always ask you questions like “Have you talked to a sales rep”, or similar. See also this good post on “MSDN Platforms (announced)“. Link to Microsoft MSDN Platforms.